40+ fashion, closet culling, fashion over 50, Man Repeller, Vintage fashion, what's the oldest thing in your closet? So what is the oldest piece of apparel in my closet that I can still wear? My most geriatric piece? I’m not talking about something vintage, something I purchased when it was already old. But things that were new when I first wore them. Well… there’s my christening gown. It’s not exactly in my closet, but packed away in tissue paper in a drawer. When we cleaned out the farmhouse a few years ago, and unpacked Mum’s cedar chest, I couldn’t bear to get rid of it. It’s pretty old. Capable of drawing the old age pension in three or four years. But since I can’t wear it anymore… I guess it doesn’t count. My oldest piece of clothing. Neither does the suede midi-skirt that I bought in the early eighties when I worked in pharmaceutical sales. I kept thinking I might wear it again, but this exercise put paid to that. It’s too small now. Likewise a lovely pair of wool Max Mara dress pants. Creeping middle-age middle. Sigh. I have several old blazers and jackets that I can and do still wear. A long Max Mara tweed blazer from the late nineties that I started wearing again a couple of years ago. A couple of other Max Mara jackets from the early 2000s that I love. 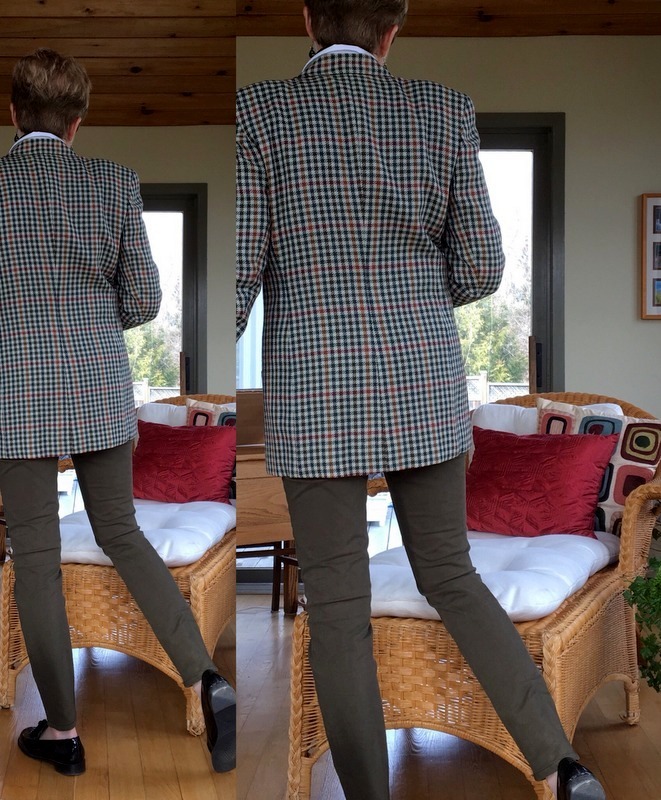 And this Alfred Sung green, gold, and burgundy houndstooth plaid jacket that I bought in… ah… the mid-eighties. Can you tell? I loved this jacket so much, for so many years. It still fits and is in perfect shape. But those eighties shoulder pads. Oh my. Nevertheless, I was game to see if I could find a way to wear it again. 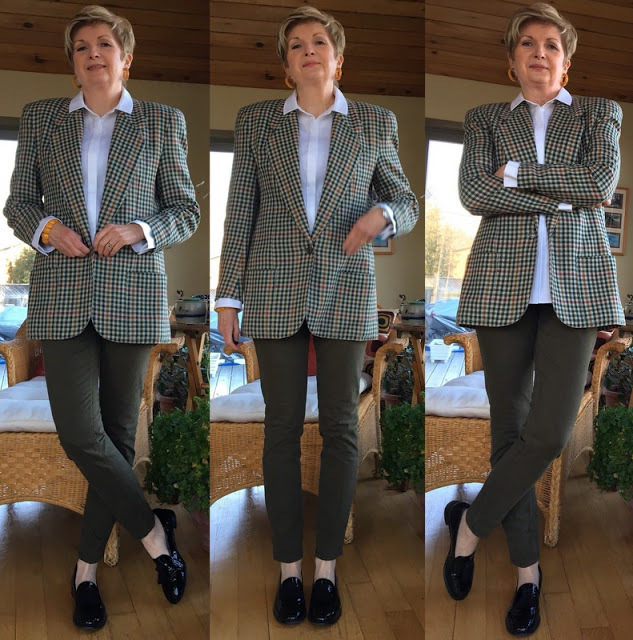 So, I tried my geriatric jacket with my Massimo Dutti khaki jeans, my Stuart Weitzman loafers, and the white Lafayette 148 shirt which I bought at the Nordstrom Anniversary Sale in July. I love these jeans with the jacket. I added the Bakelite earrings that I picked up at the Ottawa Vintage Clothing Show in November, and the vintage bracelet which I’ve had for a few years. The earrings and bracelet look so well together. But the whole look is… a bit blah. Don’t you think? So I added my green Prada sweater. Changed up the Bakelite earrings for these jade ones that Hubby and I purchased in New Zealand. And this green scarf which I used to wear many, many years ago, in university. I wore it with the green midi-skirt that I was waxing lyrical about in a recent post. But despite loving the scarf, and the jacket with the jeans, I’m feeling a bit constricted in this. I’d have to start shedding layers at the first sign of over-heating. It’s not easy wearing this much green. And this many layers. I feel a bit strangled. So I discarded the sweater. And simply twisted the scarf under the collar of the shirt to add a bit of colour next to my face. This feels better. I do love my old scarf. I’d wear this outfit. Out the door, even, not just to take photos for the blog. If it weren’t for those darned shoulders. Hubby says he thinks I might be wider in this jacket than he is in his hockey shoulder pads. I was actually thinking more along the lines of a football wide receiver, than a hockey player. Get it? Wide receiver. Ha. I wonder if I could get someone who knows about these things to remove the shoulder pads, and replace them with smaller ones. What do you think? I like the scarf with the blouse. And the jacket with the jeans. But those shoulders. Sigh. And since I was digging into my closet and hauling out old things, I pulled out this hat. I bought it new in 1984, the first winter I supply taught in New Brunswick. That would make it… ah… 33 years old. Even older than my jacket. I bought a matching scarf and mittens at the same time, but I can’t tell you where they are. I adore this hat. I wore it all that winter and felt like a million bucks. It looks lovely with the scarf I bought in Ireland, doesn’t it? I feel very Artful Dodger-ish in this. Okay, let’s sum up. What have I achieved with this endeavour? I’ve identified a couple of pieces that I will have to give away. The idea of wearing them seems impossible now. I realize that I still love this old jacket, but I can’t wear it as is. If I can do something about the shoulder pads, it might be worth my while. And I have reinvigorated my love for my red hat. Or is it orange? Or not quite either? Now, back to that Haley Nahman article on Man Repeller. I’m sure you thought when you read the beginning of this post… “Man Repeller? Isn’t that the blog that she complained about so vociferously a while ago?” Yep. It is. I was irate about their post on retirees wearing slippers and pastel baggy pants… or something like that. But even though the women who write for Man Repeller, not to mention their target audience, are probably younger than my houndstooth jacket, I still find many of their posts engaging, and witty. And besides, now that I’m not teaching anymore, I have to keep up with the youngsters somehow. I’m out of here… if I can just get these shoulders through the door. So, that’s it for me today, folks. Time to change out of my good clothes. I’m sure my geriatric jacket is tired after all this outfit trying on. I’d better get it back into the closet. Now… where did I put my baggy pants and slippers? How about you, my friends? Want to play this game? What’s the oldest thing, that you can still wear, in your closet? PrevPrevious storyDo You Need a Hygge? Such a fun post, Sue! Love your sweater look and that baker boy look is stunning! The jacket is beautiful and is not for binning. It will need the shoulder seams cut inwards as it is cut outwards to accommodate this shoulder pads. I have a few lovely jackets and it's that work that puts me off wearing them. 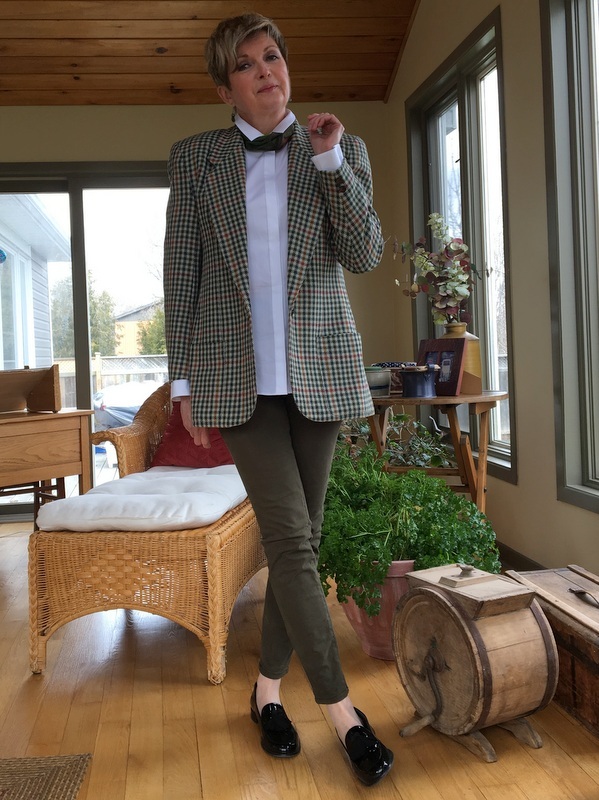 I wore a 90s tux recently with pads and what I learned from the exercise is that "manly" tailoring works well offset with something feminine. Balance. I wore a ruffled blouse and I've since tried it with a silk lacey camisole and both looks I loved. Those are definitely worth trying, maybe with your gorgeous leather trousers. The oldest thing which I bought and still wear often is a long chunky pearl necklace, though I wear relatives' jewellery which is much older. I have a brown shouldered suit bought in N.Y.in '97 (too good to bin!) which I'll try sometime soon to join in your fun! Thanks for the inspo. Hugs, x.
P.s. I think the look I'm trying to achieve with this type of jacket is that I'm out somewhere poshish and wearing something feminine and the evening gets chilly so my partner hands me his suit jacket. Maybe I watch too many romantic films!! I can totally imagine that, Mary. The over the shoulder men's jacket thing, with a gauzy evening gown underneath. But I'd need to shop for a gown. Like you I love the masculine with a bit of feminine look. Might think about my cream ruffled blouse with this. Hmmm. Wonderful christening gown Sue & that jacket shouts quality but , I agree , the shoulders need a tweak . It’s so hard to reject quality clothes . Well I’ve a coat . It’s by Laurel , a good German brand , & probably the same age as your jacket . No shoulder pads but big , loose , cut on the bias & sort of droopy in an Eileen Fisher way . Fabulous fine quality wool , big checks of navy & brown with a little cream tweedy effect here & there plus a navy velvet open collar . The navy silk lining is beautiful too . It was always meant to be big & loose , to fit over chunky woolies & jackets even . I loved it , still do, on the hanger . When I try it on , which I do periodically , there’s something amiss & I feel abit like Coco the clown . I just can’t sling it though & keep hoping that one day it will look right . Perhaps I should have it remade , but it would need to be someone with a very good eye . She could take the giant pads out of my Jaeger linen jacket too , then there’s one or two others needing attention 🙂 oh dear . It's so hard to find someone to do work like that. I've a friend who had some stuff made with lovey expensive material …and it looks a bit amateurish, in my opinion. The structure of a jacket is so important. Big and loose worn open over a lovely dress is nice… but then what if it's chilly, or snowing? Don’t want to sound ancient, but Jaeger isn’t what it was . The quality isn’t the same & the company has been struggling . Shame . I own that same christening gown that I wore in 1954, and it's tucked away in a box somewhere in this house. OH, how I remember the shoulder pads in jackets! Your jacket is living proof that we all once dressed that way. LOL Love the houndstooth fabric, but getting out the door would indeed be a problem with THOSE pads. LOL Funny post!!! That's a hoot, Pepper. I also have a little pink dress I wore with a matching crinoline. My fashion archive goes from one extreme to the other! Hi Sue, beautiful jacket … I love the fabric. As looser, longer jackets are in style again, if I was you I would definitely try to find a tailor who could alter the shoulders. Have a good weekend, we've had a dusting of snow, with more expected tomorrow. I'm feeling very festive! That's a good way to put it, Rosie. And how I'm going to think of my stash from now on… my art collection. We have had a bit of snow here too. Wish it were more. Stu is getting restless, and he can't keep cutting firewood. We don't live on a 100 acre farm… and I'm not sure where we'll put it all. I had the tailor who works at the cleaners change out shoulder pads in a coat and a tweed jacket a couple years ago, it was amazingly reasonably priced and lovely end product – the old big shoulder pads and a handful of scraps were presented to me along with the re-done clothes, but I couldn't really think what to do with them. Love the hat/scarf, they need to be back in rotation? Those shoulder pads look even bigger when you see them, don't they? I can only imagine the size of mine! You can certainly have the shoulder pads removed if you can't get back on board with them. Quality pieces like that shouldn't be disregarded. You will be hard pressed to find something as good today. Probably the oldest thing I have in my closet is my Mom's 16th birthday dress which I can actually still wear. Or at least I could a couple of years ago when I last wore it. Funny you should say that, I just saw an ad in Vogue with dressy suits with wide, wide shoulders. So there may be hope for my jacket, yet. 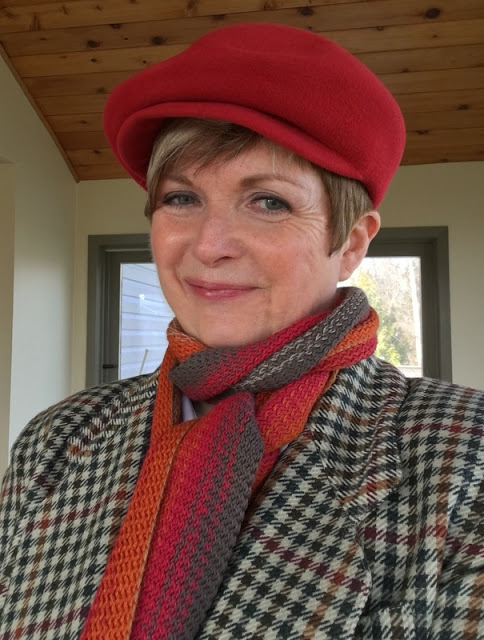 I think the oldest thing is a large scarf I bought from Harvey Nicks in London back in 1978 but I rarely wear it, except as a cover-up over a swimsuit. Apart from that, my wedding dress but I can't say I wear it too much…not a great one for holding onto things. How shoulder pads amuse now. Seemed completely normal in 1987. I love the hat and scarf on you, and the jacket is too good to discard–the fabric and construction are clearly very high quality. The oldest items I have are from Eileen Fisher. I think I bought them (on sale!) 15-20 years ago: an indigo funnel neck pullover and a purple boiled wool 'coatigan' with a waterfall neckline. Eileen Fisher is beyond my budget now but those two items are still very much wearable. Perhaps your gorgeous jacket might look better without a collared shirt and neck scarf, since the strong shoulders and wide lapels create plenty of visual interest at that level. Maybe if worn over the simple column of green and with knee-high boots to enhance the equestrian vibe, the jacket wouldn't require drastic remodeling, just a downsizing of the shoulder pads? I certainly wouldn't give it away as it is so beautiful! I might try the jacket with all black underneath… we'll see. And I may price a remodelling job. Or I may just stick it back in the closet to enjoy as an aide memoire…. still love the colours in it. I think I'll look into how much it would cost. I identified with this post. My 80's big shoulder attire is gone, but I do struggle with what to do with some 90's-2010 cashmere jackets that I love, but put back on the hanger because the pads look big to my eye. If they are coming back, as someone posted above, maybe they will soon look good to my eye again! It's funny how the eye changes isn't it? I have some old fashion magazines from the eighties. Oh my… so much obvious make-up and big hair. But it was the era of Dynasty and Dallas on TV. Oh no. That's too bad. Weird how your sweater just disappeared, isn't it? I've still got the dress I wore for my 21st. Pewter grey and still beautiful … but no reason to wear it. Maybe that has to go. Yesterday, I wore my old London University scarf from back in 1967 with a long navy trench coat. That scarf felt so appropriate, given that I was returning to the library two of the Galbraith/Rowling mysteries, which I've binge-read this week. I've loved the Cormoran Strike series, having been introduced to them by Book #1, which was our book club selection this month. Back to clothes — I still have a luxurious, floor-length, black, wool Giorgio Armani dress with shoulder pads that make yours look irrelevant. I have nowhere to wear it. But I'm never getting rid of it. 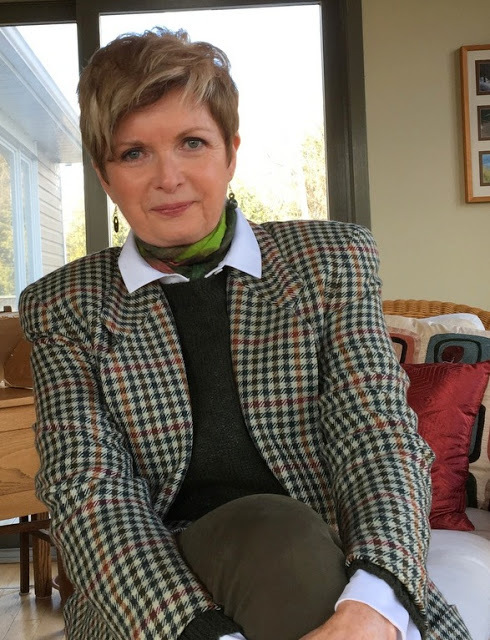 I also occasionally wear some of my mother's coats (a black fitted one that reminds me of Jackie Kennedy, a tan raincoat, a thick sweater jacket, and a wraparound black/cream herringbone). Hugged in my dear mother's outerwear, I feel incredibly safe. Sigh! P.S. I bought the Armani on sale in the very early 80s at Bullock's Department Store in Los Angeles. I adored that store and at this time of year still miss the Christmas teas at the Bullocks Wilshire. My mother's coats (which she purchased in Texas and Mississippi) date from the '70s and '80s. Your mother must have had great taste, Ann. How lovely to have her coats to wear. I have a beautiful wool gabardine taupe raincoat I bought in 1988. I got it at a specialty discount store in season, and saw the very same coat for several hundred dollars more at Bloomingdale's the very same week. I guess they made too many and/or decided different people would buy at different price points, and this thing wasn't cheap regardless. The store was not like discount stores of today, it was on Manhattan's Lower East Side where there were many such stores where there was no loss of prestige for the label to be sold there. Anyway, I love this coat although I haven't worn it for a while bc of the shoulder pads. They need to be removed and the raglan shoulder seams reworked. Btw, shoulder pads (lack of) is what makes Eileen Fisher so timeless. The literary connection, something I think of around that coat: Heinrich Boll's masterpiece _Group Portrait With Lady_ features as its heroine a naively moral and instinctively good person, Leni Pfeiffer, who comes from a wealthy background and becomes anything but. There is a reference to her beautiful and expensive wool tweed skirt lasting for decades. I can't summon up the quote, and while I admire the book for its remarkable portrait of WW2 Germans, the line about good clothes spoke to other parts of my consciousness. I love it when a writer takes great care to describe what his of her characters are wearing. There's a lovely blog out there called "Clothes in Books" that reviews different books and examines excerpts which discuss clothing. I guess clothes have always been important touch stones for me. I remember not only what I've worn but also many outfits that my mother and older sisters wore when I was little. 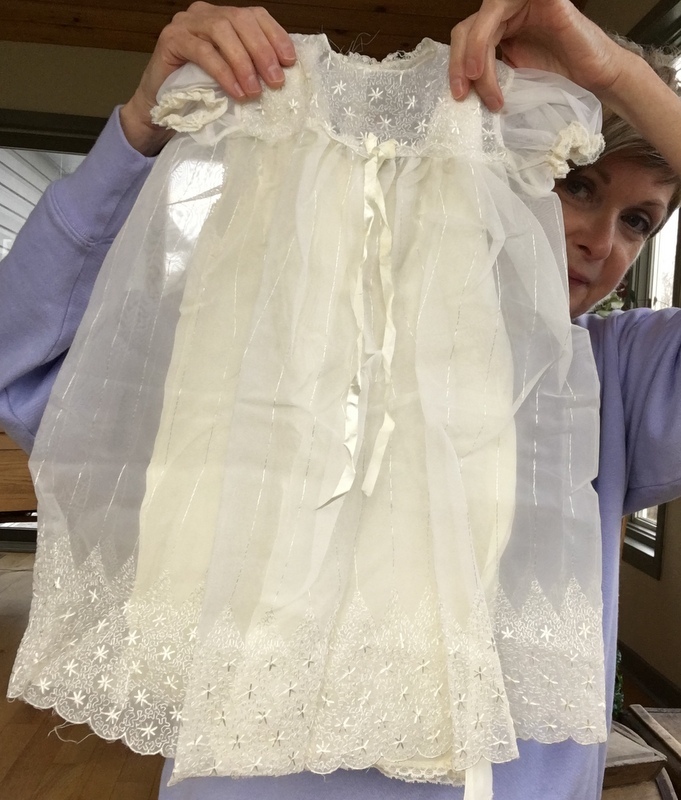 Not sure I'll frame the christening gown… but I won't part with it either. My oldest pieces are probably Morris dance tee shirts from various events I attended in the early 90's. And my kit (complete with bells). I don't actually wear them, but can't bear to give them away. I think you could definitely have those shoulder pads "minimized" though it might involve taking in the shoulders a bit for proper fit. But it's a nice looking jacket, might be worth a try. I'll try that, thanks, Lise. Does it matter if I use my iPad? Because this one is from an iMac and seems to have posted. Argh. Sorry about that. I just commented on the blog using my i-pad, as "anonymous" and it worked but there was a two-step "captcha" procedure which I know is a pain, but I can't get do anything about it. But it looks from the logo beside your name that you're using "Blogger" to comment. Do you sign into Blogger first? Sorry to sound so clueless about it. The oldest garment I have isn't all that old…it's a twenty y.o. pair of khaki capris that I bought while living in California in the mid-90's. They are high waisted (isn't that coming back? ha!) and I keep them to gauge my weight and size. Every spring I try them on to see how the winter went. If they're tight I know I need to move more and eat less. One year (after my dad died) I couldn't close the zipper and button. It's a little crazy, but it's just something I've fallen into and continue for whatever reason. Other than that, I'm known as a "chucker", i.e. I purge my closet and shoes on a regular basis. If I haven't worn something for a while (or if a pair of shoes hurts), off they go. High waisted capris are back… and who knew they'd be so useful:) "The Chucker"… love that. I LOVE your blog! And the christening dress is amazing! Such a wonderful momento. I have recently been furiously downsizing and recently sold a buttery soft beautiful short fringed leather jacket. I just thought the fringe and the cropped look was way too young for me and it needs to be worn and appreciated. I hope I don't someday regret that. Perhaps one of my oldest pieces I still have and plan to wear is a late 80's wool winter white London Fog coat. Just gorgeous and I don't think I will ever get rid of it. Of course, I only wear it once a year, maybe, and I am retiring to a warmer state before the next winter falls. I also have a gorgeous sort of boxy Eileen Fisher wool crepe shirt dress that I tried to sell and had no takers, fortunately. I figure someday, I will enjoy it again when I feel like getting dressed up. I just hope for the proper occasion now. Keep up the good work, making me think about such things! I think you made the right choice… is you had to keep one, hang onto that winter white coat! And that Eileen Fisher dress.